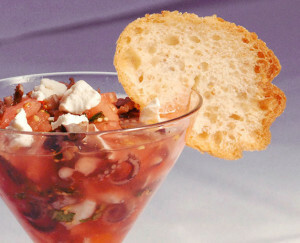 Watermelon, Baby Octopus and Goat Cheese in a watermelon vinaigrette. Baby octopus appetizer often has a place on Canary By Gorji’s menu. This tasty, sustainable sea creature is pan-seared and joins diced watermelon, goat cheese and watermelon vinaigrette in this rendition. Baby Octopus with Squid Ink has also been featured on the menu from Chef Gorji’s cookbook, Zing! For some other ideas for octopus dishes see 10 Octopus Dishes reported on in a Houston Press article. Other New mediterranean cuisine offerings this summer at Canary By Gorji. Joining the Baby Octopus With Watermelon on the menu over the summer include Seared Texas Quail Legs in pomegranate reduction, Lamb Tongue Crostini and Baby Eggplant stuffed with Gorgonzola over pomodoro, Tomato Ice Cream Smoothie and Heirloom Tomato Panzanella salad. No Replies to "Baby Octopus Appetizer with Watermelon & Goat Cheese"